Together with a number of later Victorian and Edwardian 'artist potters', Wallace Martin, Walter Martin, Edwin Martin and Charles Martin (the Martin Brothers) produced handmade vases, jugs, jars and sculptures for an eager public conditioned by William Morris and the artisanal ethos that created the Arts and Crafts movement. 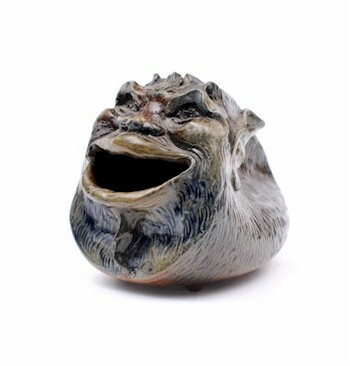 A Martin Brothers Grotesque Spoon Warmer (FS11/456). The brothers' early development was largely unremarkable. Wallace Martin, who became the primary modeller amongst them, was trained at the Lambeth School of Art and subsequently did a stint at the Watcombe terracotta works in Torquay. His canon then largely consisted of copies of existing works garden statuary, large urns and the odd portrait bust and plaques. His younger sibling Walter Martin also attended the Lambeth School and got a job with the nearby Doulton works, until he was injured falling from his pigeon loft and was replaced in turn by his younger brother Edwin Martin. By 1873, the Martin brothers had set up their first independent business nearby in Fulham and their initial output was influenced by the principal decorators and modellers they had met whilst working at Doulton. Their debt to more comical pieces by George Tinworth and incised animal centred decoration of Hannah Barlow bear this out. 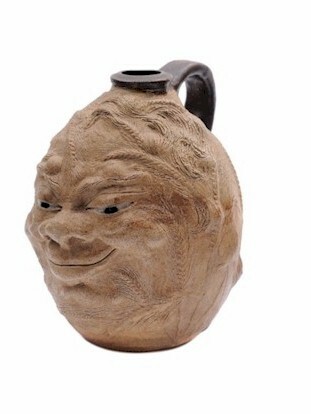 A Martin Brothers John Barleycorn Jug (FS9/556). As well as modelling and glazing, the brothers also had to market and sell their own work so Wallace and Edwin were not averse to making house calls with a carpet bag of suitably smart pieces. Slowly their reputation began to build and by 1877 they took a lease on an old soap factory in Southall shortly after this Charles Martin was asked to join his brothers and manage their showrooms. They even undertook a short tour of the West Country demonstrating their techniques live to the citizens of Falmouth, Torquay and Exeter. As business grew, there was some tension in the newly extended family business as Charles turned out to be something of a tyrant. Although their output had a spontaneous look and feel to it, there is evidence that Charles stipulated the size, shape, spouts, handles and even the type of decoration on virtually everything. His iron-handed control even extend to the size and shape of the 't' in their signatures! However, one benefit of not worrying about selling, marketing or manning a gallery was that the remaining brothers could give full vent to their creative juices and perhaps allowed them to produce their most striking and memorable work. I am unsure where their propensity for the gothic and the grotesque came from although the naturalistic work of the sixteenth century French potter Bernard Palissy is certainly a good candidate. 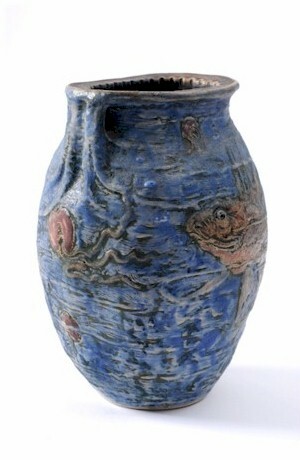 A Martin Brothers vase decorated with jellyfish, fish and crabs (FS1/35). Jelly fish, crabs, dragons and other anthropomorphic and mythical beasts appeared as decoration. There is even a meticulously rendered 'dead parakeet' produced in the 1890s which surely (before the age of both Monty Python and Damien Hurst) must have held little commercial merit, although it seems to me an exquisitely beautiful object; but it was the seemingly ludicrous works like these that opened the door to the fanciful so called, 'wally bird' jars and covers and the rather unsettling spoon warmers that owe their heritage more to gargoyles than anything else. The Martin Brothers really did seem to push the boundaries at the time but have subsequently become the most eagerly sought after pieces of English art pottery.